At the end of the day Cobb Tuning’s awesome 2009 GT-R took the champion’s podium in the AWD PRO class (1:22:19), followed by Dr. Rick Edwards in a 2008 Mustang FR500S spec racer in the RWD PRO class (1:26:012), and a big golf clap to Erick Miller for rounding up FWD PRO in his 1993 Honda Civic (1:33:12). Worth noting, Steve Pepka in the Supra 6-powered 1971 Datsun 510 pulled a 1:31:294, pretty impressive for a nearly 40 year old chassis. A complete rundown of best times for the first Driving Sports Time Attack Challenge can be found at DrivingSports.com. What is the GT-R's Real Horsepower ? 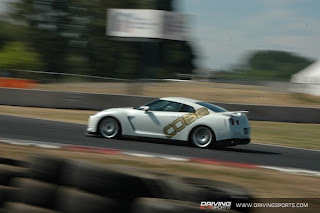 GT-R Spec V ? : Vspec ? : Evolution ?